No matter you are PC followers or Mac zealots, the chance of watching videos on YouTube in everyday life is infinite. However, what will you do in case your Wi-Fi is on the fritz or have you ever been down in the mouth for the snail-like network? For example, you just attempt to enjoy Taylor Swift new song Style, Drake Views From The 6 album songs while on the move or perhaps you feel like to enjoy a cuddly dog video on your PC computer when you leave your network behind. Consequently, to download YouTube video free is the way to go for untethered enjoyment. Actually, there are many free programs in the market claiming the ability to save YouTube video for free. But the more choices you have, the more difficult it will be to decide which is the best YouTube downloader for Mac or PC. Well, don't worry; let us be your guide. In this article, we list two best free YouTube downloader software, one for Windows and one running on Mac OS X, to help you grab YouTube videos for free. 100% free to download YouTube videos, 720p/1080p HD, 4k/8k UHD, movies, music, TV shows from YouTube, Dailymotion, Vevo, Vimeo, etc. Fast speed and high quality. 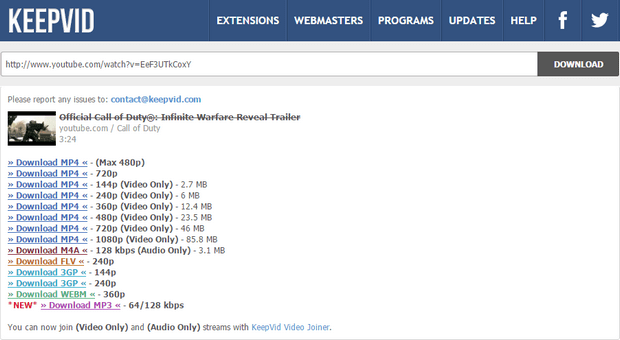 There doesn't seem to be a top contender in terms of the best YouTube downloader ever that works on windows operating systems, but KeepVid tries its best. As an easy yet free online video grabber tool, it meets all YouTube downloading needs on your PC, allowing you to free capture videos from YouTube, Vimeo, Metacafe, and other video sharing websites. However, by far the biggest gripes about this freeware are that it eats up a lot of precious time and stuffs unbearable advertisements. Worse still, if you are running a Mac OS X, you'd better make a switch to KeepVid alternative for Mac to download YouTube videos free. MacX YouTube Downloader shines among the arena of the free YouTube downloaders exclusively for Mac computer. The variety of formats and resolution choices enable all Mac users to free download videos from YouTube （including the hottest 360 degree video download) for further playback on almost everything from Apple iPhone iPad to Android phones with admirable speed. The HD video download option is a nice touch, not to mention the ability to simultaneously download and preview multiple videos at once with this best free YouTube downloader for Mac (High Sierra supported). Its sleeve interface makes everything a no-brainer. Besides, it also serves as a good Keepvid alternative for Mac. Below is the step-by-step guide on how to grab YouTube video free to Mac platform. 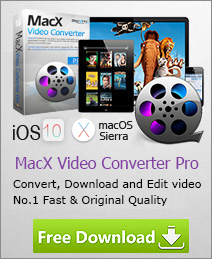 Step 1: Free download and launch this free YouTube downloader on Mac OS X. Find a video you'd like to watch offline, copy the URL of the video page. Then paste the URL and click "analyze" button to load the YouTube video. Or simply hit "paste & analyze" button to automatically detect the YouTube video opened in browse. Step 2: Choose video format, resolution and file size as you like. By the way, this best Mac YouTube downloader packs the feature of automatically adding output MP4 videos to iTunes Library for transferring to iPhone, iPad, iPod or any other further use. Step 4: Click "Download Now" button and commence to download YouTube videos free on macOS. After the process is finished, you can eventually watch YouTube on TV, smartphone, tablet, computer, game consoles, etc. offline. Tips: if you feel like to save YouTube videos to more output formats like MP4, MOV, FLV, AVI, MPEG for later viewing on iPhone 8/Plus, iPhone X, iPad Air 2/Mini 4, Galaxy Note 8, etc, MacX Video Converter Pro is a solid choice for you. YouTube download legal or illegal? Well, you can legally download YouTube music and video for free once you use the right way. Or it's illegal to download YouTube contents. Have you ever wanted to download YouTube HD video on Mac free? Have you found a good solution? Well, the answer can be found in this article, which shows you a free YouTube downloader, so that you can easily save the YouTube HD video free and share with friends on the go.